I have a navel orange tree that flowered like crazy, produced a ton of fruit but 99% of the fruit fell off. I have one orange as of now and the same thing happened to my dad's tree as well. Do you know why that is happening? He has lemons and limes that are doing great. Isn't that annoying? Flowers everywhere, and then suddenly all seems for naught. All citrus trees experience a certain amount of fruit-drop, but Navel Oranges in particular "shed unusually freely," which is the academic way of saying: hey, all the fruit fell off! Citrus fruit drop is often called "June drop" because it happens in May. 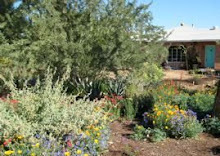 May and June are typically the most stressful season for plants in the Desert Garden. The Spring rains are past, the temperatures are rising markedly, and the atmospheric humidity of the monsoon season is still in the future. In response to these stressors, citrus trees "balance the load" by dropping excess fruit. It's essentially a physiological response to conditions that helps to ensure that the tree has no more fruit than it can support. Remember, with all fruits, while our goal is food, the tree's "goal" is reproduction. So from a tree's perspective, if it had one, which it doesn't, because it's a plant, but let's not quibble, a very few healthy fruits (with their seeds) is a better situation than tons of struggling fruit. That gives us a clue as to why Navel Oranges are more prone to "shed unusually freely." Navel Oranges are mutant sports of another orange tree, and they don't produce fruit sexually; they produce fruit parthenocarpically, meaning without cross-fertilization. The term itself is from the Greek, parthenos meaning virgin, and carpos meaning fruit. And that fruit is seedless, so, while from our perspective a Navel Orange tree may be productively loaded with wonderful fruit, technically the tree is sterile. When June drop occurs and a citrus tree begins to shed excess fruit, priority is given to fertilized fruit. You noted that your dad's lemons and limes are doing fine; I would bet a donut that they also lost fruit, but since most of their fruit is fertilized, they kept much more on the tree than did the Navel. The Navel fruit is sterile, so of lower priority in the grand scheme of reproduction. What do you do about it? The key is to remember that it's the stressors that trigger June drop, so the solution for future years is to minimize the effects of the stressors. As the weather heats up and dries up in late Spring, be certain that your Navel tree has been watered deeply and is thoroughly hydrated. We tend to not worry about upping the irrigation until full Summer, but it's late Spring that nails the tree. You can't go by the calendar. This year, for instance, the Desert Garden stayed pretty cool fairly late, and then heated up fast in early May. Each year is different. As always, the goal is deep but infrequent irrigation. Try to get the root zone, out to the canopy of the tree, watered to depth of three feet into the ground. This gives the tree moisture reserves to draw on, and encourages deep rooting. Don't let the tree stand in wet soil, though; this can also be a stressor. Along with your deep irrigation, be careful about how you fertilize your tree. Always give the first dose of fertilizer at or before full bloom, water it in thoroughly, and use lower amounts than listed on the fertilizer label. Three small doses of fertilizer spread over time is a much better method than one big dose all at once. I recommend not fertilizing again until the fruits are at least the size of a golf ball and June drop is past. We typically over-fertilize our home citrus, so err on the side of restraint. And now for the good news: little green citrus fruit are adept at hiding among the leaves until sometime much later in the year when they suddenly turn bright orange and surprise you. You may still have more fruit this year than you think.